A good night’s sleep determines how well and productive your day will be. If it were not, then doctors would not be advising you to have a good night’s sleep when you come down with an illness. I always feel cranky at work when I do not get enough of my sleep. The quality of sleep that you will get depends on several factors; some personal and some are dependent on the quality of bed sheets you use. Top class sheets should be able to soothe you to sleep even in extreme conditions naturally. When it comes to top class sheets, you would not ordinarily expect to find ones made from a hard and dense plant in the name of bamboo. Bamboo sheets are gaining popularity as time goes by due to their unique properties not found in other fibers for making sheets. These sheets can keep you cool during the summer and warm you up during winter. If you are still perplexed and trying to figure out how a bamboo sheet would look like, do not worry. We will explain why these products are becoming popular and also do a review of the best bamboo sheets. At the end of this review article, you should be able to choose one with your eyes closed. 2 What Makes the Best Bamboo Sheets? A Bamboo plant is one magical plant. It can be converted into several products, both household, and commercial. You can find bamboo used in making flooring material, fencing posts, lately sheets, beds in medieval times and a wide number of other uses. The idea of using bamboo to make bed sheets is still a new one. It is unknown to quite a number of people. To those of us who have used them, they are as amazing as they come. You will not regret it. Do not mistake this to mean that they do not come with their fair share of drawbacks. They too have weaknesses. Let us take a look at these benefits and drawbacks of bamboo sheets. Sleep is not just about having sheets to cover you. How comfortable these sheets are will play a key role in determining how comfortable your sleep will be. I bet this is the main reason why your current sheets may not be cutting it for you. The rayon which is derived from bamboo is known for its softness. The softness level is comparable to cashmere or silk. This gives the sheets a phenomenal comfort as you sleep. The softness adds to the soothing effect during your sleep, softer than the renowned cotton. Another contributing factor to the higher comfort levels is the breathability that bamboo fibers offer. Bamboo has a naturally porous construction that makes it very breathable. In addition, this property makes it great for wicking away sweat and ventilating the sleeper. Bamboo fibers expand and contract naturally; helping keep you cool when it gets warm outside and warming you when in cold weather. Bamboo plants require very little water and chemicals to grow. They use the water they get from rainfall, do not require any artificial fertilizers and are fast growing during their cultivation stage. During the harvesting of the plant, it is cut above the ground, leaving behind a vast network of roots which continue to grow and can be harvested again after they have matured. More emphasis is being given to such kinds of renewable resources to reduce environmental strains. Bamboo plantations are also known to absorb carbon dioxide from the atmosphere than timber and cotton. In return, the plants release more oxygen back into the atmosphere, improving the air quality. Here is another aspect of your bamboo sheets that you further add to the environmental friendliness. Bamboo is natural, organic and 100% biodegradable. As a sleeper, you are given a peace of mind knowing that you are doing good to the environment even as you are kept cozy. The bamboo fibers used to make the sheets are natural hypo allergens and have antibacterial properties. The bedding is not given any chemical treatment during its production and growth. This property makes it a suitable option for babies and infants use. Since bamboo has good moisture wicking properties, the sheets reduce the moisture presence on your bed. In return, dust mites, which often trigger most allergies, are eliminated from your bed. The antibacterial properties also provide a sleeping environment free of any bacteria and pathogens. Bamboo sheets are hence non-irritant making them suitable for those with sensitive skins. Bamboo fibers are stronger than traditional fibers. This ensures that you get long years of comfortable sleeping nights. For premium sheets options, the yarn strands are made from long fibers intertwined together throughout the whole length of the sheet. The sheets are therefore less prone to pilling and tear. These are common drawbacks of some sheets. Another feature that makes bamboo sheets durable is their nonabsorbent feature. The oils your body produces are not absorbed into the sheets. They do not gray or yellow over time as traditional sheets do. These sheets would look brand new for years. Since bamboo fibers are odor resistant, it means that they need less frequent washing in comparison to traditional sheets. The oils that your body produces are also not absorbed into the fibers of the sheets. This makes bamboo sheets easier to wash. The initial cost of acquiring bamboo sheets is quite high. The sheets are slightly more expensive than cotton and other traditional sheets. This is mainly due to the complex processes used to extract the fibers and then spin them into yarns. When the appropriate care is not taken when using bamboo sheets, they may crease easily, making for a less lovely sighting. Since they are sleek, soft and seem delicate, you need to take extra care when using them. What Makes the Best Bamboo Sheets? Now that you have seen what benefits bamboo sheets can get you, you might now be convinced to buy one and have a feel for yourself if you are still unsure of what exactly you will be looking for as a first-time buyer, or if you are making an upgrade. Since not all bamboo sheets are made equal, what exactly makes the best bamboo sheet? Discussed below is the information you need to look out for. Bamboo sheets are available in some material options. You can get 100% bamboo sheets or a blend of other fibers to achieve a specific property. The best bamboo sheets are always the ones that are 100% bamboo. These sheets utilize the full benefits provided by bamboo. They are soft, durable and eco-friendly among other features. During the manufacturing process, the raw bamboo is dissolved in non-toxic solvents in closed loop systems. The result is a soft and strong textile material. Other available options include blends with cotton in various ratios. There is 60% bamboo to 40% cotton and 70% bamboo to 30% cotton. This blend improves the strength, but compromises on the softness of the sheets. Bamboo sheets may be made from the same blends or 100% of the bamboo, but will definitely differ based on the type of weave used to make them. The feel and looks of the sheets will be very much different. There are two types of weaves generally used: Twill and Sateen Weave. Sateen weaves result in the best bamboo sheets. The “1 under and 3 yarns over” yarn type of construction results in a smooth, denser and more lustrous sheet. This type of sheet gets its silky feel from the 3 exposed threads in the weave structure. This type of weave requires extra care to prolong its lifespan. Another lesser lustrous weave is the twill weaves. You can spot this type of weave with its signature diagonal twill line. It is tight, fine and short, but not as soft as sateen. It is softer than cotton or bamboo blends though. On a positive note, this weave is sturdier than sateen weave. This is important if softness is not a priority but sturdiness is. To identify if the sheet you are buying matches these features, always look at the material label. The type of material used and the weave type should always be indicated. You need to be mindful of the shrinking factor of the sheets you are buying. It is very embarrassing to buy sheets that after washing shrink to half their original size, or expand to twice their size. The best sheet should have the least shrinking factor or none at all. The care methods of your sheets determine how long they will last. You need the best bamboo sheets that you can either tumble dry under low heat or line dry. There are conditions that might hinder any of these methods, so you have to be able to dry the sheets either way. The DTY Premium bedding is a luxurious, soft and silky 100% bamboo sheet. The opulent bed sheets are strong and lightweight so that you enjoy a comfortable night’s sleep. 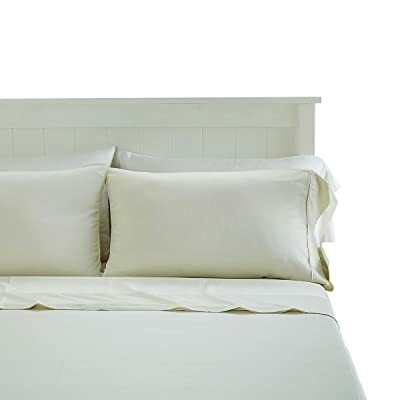 These sheets make use of the bamboo’s natural moisture and temperature management properties. To keep you comfortable during hot weather, the sheets wick sweat away from your body, helping to adjust your body temperature for a comfortable sleep in the summer. When it is cold, the sheets absorb the moisture in the air hence preventing it from reaching your body. By being 100% bamboo, the sheets are also hypoallergenic, antibacterial, antifungal and resist odors. These properties are valuable for those with sensitive skins and are allergy prone. Made from 800 thread count yarns, these are some of the finest sheets that your money can buy. The utilization of bamboo in its manufacture reduces the impacts these sheets have on the environment since bamboo is very eco-friendly and sustainable. The extraction of the bamboo fibers also uses non-toxic chemicals in the processes. This product comes in 4 pieces containing 1 fitted sheet, 1 flat sheet, and 2 pillowcases. The Royal Hotel sheets are made from 100% rayon extracted from Bamboo. With a thread count of 300, the sheets decently balance the density and porosity. This ensures that the sheets are not too porous to let in the cold and not too dense to reduce the breathability of the sheets. 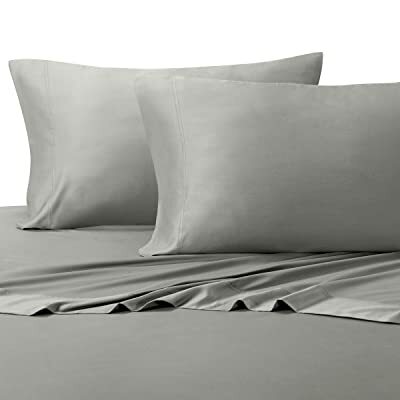 These sheets are sateen woven to give them a lustrous and silky appearance. The sateen weave makes the sheets extremely comfortable just as any person who appreciates a good night’s sleep would love them to be. To care for your sheets, only cold wash them with the delicate cycle setting using a mild detergent. When drying, use low heat cycle then remove the sheets immediately. No bleach should be used on the sheets. If need be, you can press warm them (lowest meaningful temperature). The soft bamboo feel provides more absorbency properties than cotton sheets. They absorb 60% more moisture than your average cotton sheets. This property is essential when regulating your body temperature during either winter or summer when temperatures are at their extremes. The Cariloha Classic bamboo sheets are made from a twill weave for sturdier and comfortable sheets. This type of weave is found useful by those who prefer stronger sheets at the expense of the more lustrous sateen weaves. The sheets are threaded with a thread count of 230 (the number of wefts and warps per square inch). This thread count maximizes the softness of the sheets while still ensuring the sheets are breathable, strong and lightweight. The resulting softness surpasses that provided by a 1000 Thread Count (TC) Egyptian cotton. The sheets are made to fit easily around your pillow top mattresses. The individual sheets come with deep pockets as extras. This prevents the corners of the sheets from coming up. Some sheets are quite challenging to wrap around your mattress but not these. A thick, full-length elastic is fitted around the edges of the sheet. These naturally breathable sheets have excellent moisture wicking properties, making them around 3 degrees cooler than sheets made from cotton. Your comfortable sleep will be guaranteed throughout the year. The sheets repel odors and allergens naturally, ridding you of allergic reactions. To save on the environment, these sheets are made from bamboo that is both renewable and biodegradable. You enjoy your sleep and save planet earth too. 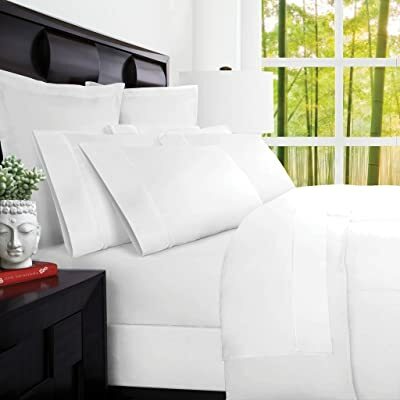 These best bamboo bed sheets are made from 100% rayon derived from bamboo. They will provide you with the sleeping luxury and comfort that your sleep may demand. The stylish sheets are available in an array of colors that you may want. This is for those whose sleep also depends on the color of the sheets covering them. 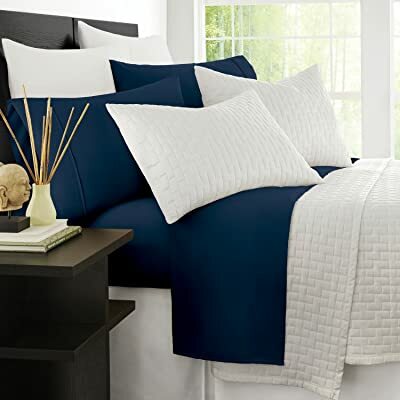 High-quality plush rayon extracted from bamboo provides smooth and highly breathable sheets. In return, you get more plush and durable sheets than your average standard sheets made from cotton. These sheets are made to be hypoallergenic, fade resistant, stain resistant and wrinkle resistant. These properties save you from dust mites, tedious ironing and wrinkles. 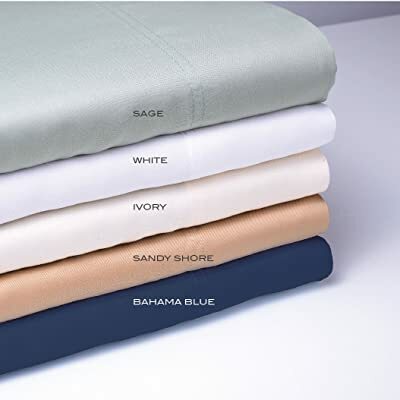 These machine washable bamboo sheets are easy to care for as they stay wrinkle free after washing. Potential itches or rough feelings on your skin as you sleep would be a forgone past in case you decide to buy these sheets. The Zen Bamboo Luxury Bed Sheets are made from a blend of Rayon derived from bamboo and microfiber. The blending consists of 40 % bamboo and 60% microfiber. The brushed bamboo and microfiber make them plush and lustrous. The blending also utilizes the strength of microfiber and the softness of bamboo fibers. These sheets provide a stain resistant sheets care free of mites, ironing, and wrinkles. This allows you to easily clean the sheets since you will not require to use tough stains (they do not stick to the sheets). If you are looking for blended bamboo sheets which are different from the 100% bamboo ones, then this could be your choice. They combine strength and the luxury of bamboo fibers to produce a sheet for a peaceful sleep. Sleeping time is enjoyable when you have the lustrous and soft bamboo sheets. With such conditions, one could be tempted to stay in bed all day long. However, if you do not follow the appropriate care instructions, your blissful sleep could be short-lived. Here are some of the care instructions. When it comes to washing your sheets, always use mild detergents. Bleaches or vinegar have damaging effects on the delicate bed sheets. You would also want to avoid using hydrogen peroxide-based detergents for longer lasting sheets. Baking powder can be used to brighten the sheets and make them fresher. Do not use hot water when washing the bamboo sheet. The heat damages the bamboo fibers used in the sheets. The care instructions specify that you use cold wash and run it through the gentle/delicate cycle. For optimal results, you can hand wash the sheets although none of you will be having the time. Use stain removers that do not contain any chlorine as well. All of the bamboo sheets that you will buy will instruct you to line dry the sheets. A good weather for air drying is not always available to some people hence the alternative of a low tumble drying. Quickly remove the sheets from the dryer before they start to wrinkle. You need to remove them when they are still a little warm to inhibit the wrinkles formation. When ironing, use the lowest setting possible and do not use steam. Unless of course if the creasing is really bad. The sheets are very absorbent, and should never be stored while still wet or moist. The more it absorbs moisture, the more the sheet gets damaged. The damage or rot is always irreparable. Always have more than two pairs of bamboo sheets so that you do not overuse a single one. Once the current one gets dirty, replace it with a fresher one. The lives of the sheets are prolonged in this manner. The bedding market is filled with various products made from varying raw materials. None of these offers you the comfort that the best bamboo sheet provides. Some of the softest bed sheets that you can find are made from bamboo, coming with antibacterial properties. These luxurious bed sheets come at surprisingly very affordable prices, yet provide more luxury than some of the cotton alternatives you will find in the market. To sweeten the deal, you will rest easy knowing that as you sleep in sheer comfort, you are also conserving the environment. Have you ever used any of the bamboo sheets discussed above? If yes, which one have you used before? How can you describe its performance? Which one are you planning to buy next time? Yep, it definitely helps maintain comfortable body temp through my sleep. I used to be a bit sweaty when I sleep, but I never experience it now since I got my bamboo sheet.